Bubble Strawberry - Freshly picked strawberries mixed with a delicious bubble gum. Bubble Grape Fruit - A Sweet & Tart Grapefruit Paired With Bubble Gum. Bubble Berry - Mixed Berries Paired With Delicious Bubblegum. Bubble Apple - The summertime flavor of green apple bubble gum is the perfect well-balance you will constantly enjoy till the last drop. Bubble Melon - The mouthwatering flavor of juicy sweet watermelon bubble gum like you never had before. Satisfy your taste buds with a classic watermelon bubble gum vape. Bubble Purp - The mouthwatering flavor of juicy sweet grape bubble gum like you never had before. Satisfy your taste buds with a classic grape bubble gum vape! Bubble Razz - The mouthwatering flavor combination of sweet blue raspberries and bubble gum like you never had before. Satisfy your taste buds with a classic blue gumball vape! Bubble Punch - Is as bubbly as it is yummy. 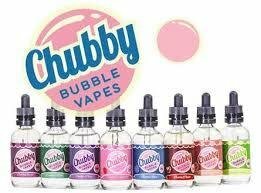 Chubby Bubble's signature bubble gum base is infused with rich and flavorsome tropical punch for a tart yet sweet knock-out profile.